I don’t know about you, but when I see fish on a menu — any kind of fish — I tend to glaze over. This doesn’t make much sense because I actually like fish; I have no seafood phobias and I often cook fish at home. What’s more, when scanning a restaurant’s options, I’m often looking for an alternative to red meat (which is always the first place my eye goes when deciding what I’m going to eat). Still, it’s the rare occasion when the server comes over to take my order and I say, “I’ll have the halibut,” or “the snapper,” or whatever fish option happens to speak to me, if one does. The reason is simple: I’m usually disappointed with the seafood that comes out of restaurant kitchens. This is probably unfair to whoever’s manning the stoves there, because as often as not the dish is perfectly acceptable, even good. The problem is that when I sit down to a meal I want something with a little gusto, something that won’t leave me pushing away from the table still feeling hungry. For whatever reason, that’s usually not what the waiter delivers. So except on those rare occasions when the menu copy lists ingredients I know promise big things on the flavor front, and when previous outings to the establishment in question have shown that the serving sizes there will satisfy even my gluttonous tendencies, the solution has been simply to make it myself, in my own kitchen. There I know that the portion size can be adjusted according to the appetites of those eating, and I can concentrate my efforts on recipes that call into play the sorts of things that deliver the big flavor payoff I’m after. The recipe I bring to you here is a perfect example. It’s one I pulled out of Gourmet several years ago and it never fails to satisfy my carnivorous tendencies. For one thing it calls for filets of mahimahi, a sturdy white fish that’s meaty without being steak-like, and that has a mildly sweet flavor (making it ideal for those worried about small bones or put off by a surfeit of “fishiness”). And, as an added bonus, it also rates high with environmentalists, since their populations tend to grow quickly and are therefore resilient to fishing. 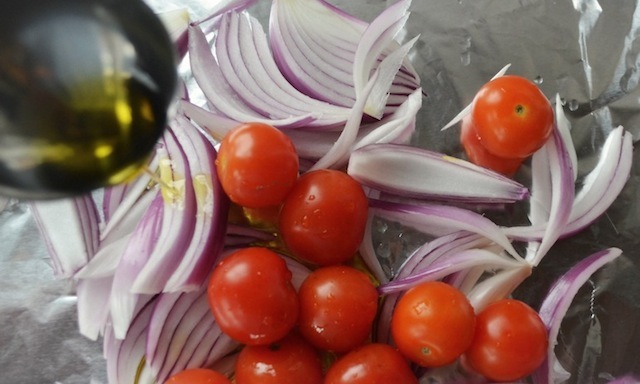 In any case, the filets are placed on a foil-covered pan alongside a quantity of cherry tomatoes and some chunks of red onion, all of it moistened with olive oil and seasoned with a little salt and pepper, and then slipped under the broiler for fifteen minutes or so. And that’s the heavy lifting portion of the exercise. Seriously. Now some of you may have picked up on the word “broiler” above, an element that, of course, means we’re talking about broiled fish here — the stuff of so many uninspired school lunches and coffee shop dinners. That for me is one of the pleasures of this recipe. 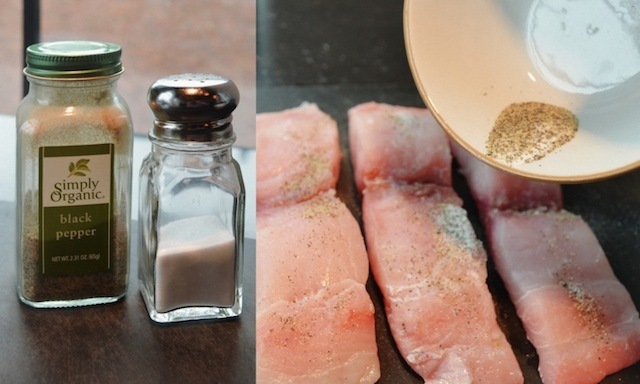 Because while broiling may be a method of cooking that’s come to mean dry and flavorless where fish is concerned, as this recipe proves, it is possible to blast a piece of fish a few inches beneath a heat source and still end up with something moist, flaky, and compulsively eatable. But I’m getting ahead of myself — it’s not time to unfurl the napkin just yet. 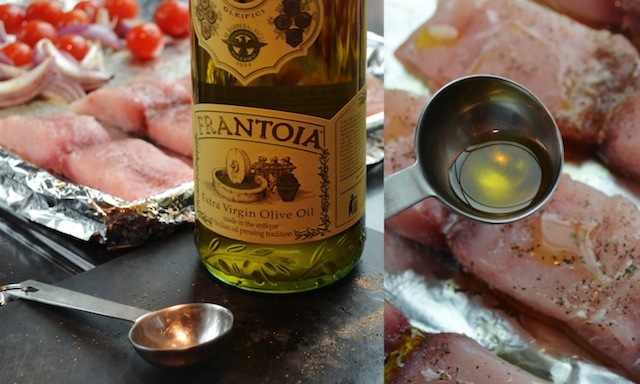 So back to the cooking… While the fish is in the oven you’ll have ample time to whip up the vinaigrette that’s drizzled over the fish, and that, like phase one of this simple recipe, takes mere minutes to prepare. This comprises just a small amount of red-wine vinegar mixed with some black or green tapenade, a little pepper, and a small amount of olive oil, and yet it’s so much more — a perfect example of the whole being greater than the sum of its parts. Credit the winning combination of the tapenade with the oil and vinegar for this, the result of which is wonderfully tart and tangy, yet not overly so. As such it’s the perfect counterpoint to the simple flavor of the broiled fish and to the natural sweetness of the caramelized vegetables, lending the whole thing a bright, zesty flavor that’s as sunny as it looks on your plate. 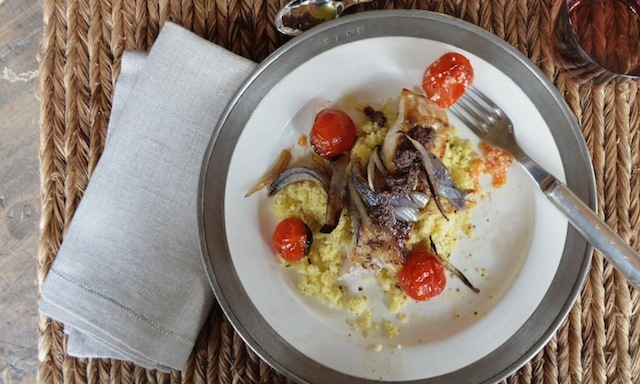 The recipe suggests serving the fish on a bed of plain or Parmesan flavored couscous. Both are good accompaniments to this Mediterranean-inspired dish, though for my money, you’re better off with the Parmesan option — the mellow saltiness is just the thing in the company of the other flavors on your plate. (A number of brands, such as Far East, offer a version that comes with a Parmesan seasoning packet, or you can make your own by simply tossing the cooked couscous with a 1/3 of a cup of fresh Parmesan cheese, along with a tablespoon each of lemon juice and olive oil.) Either way, this is likely to end up as one of your all-time favorite fish recipes. It’s certainly one of mine. And the fact that it takes mere minutes to prepare means I don’t have to wait until the weekend rolls around to enjoy it. —Preheat broiler and line a large shallow baking pan with foil. 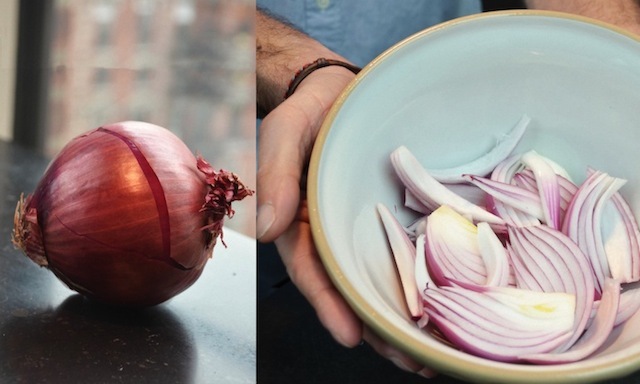 —Toss onion and tomatoes with 3 tbs oil, ½ tsp salt, and ¼ tsp pepper in lined baking pan, then spread evenly in one half of pan. —Pat fish dry and sprinkle with ¼ tsp each of salt and pepper, then arrange, skinned side down and spaced apart, next to vegetables in other half of pan. 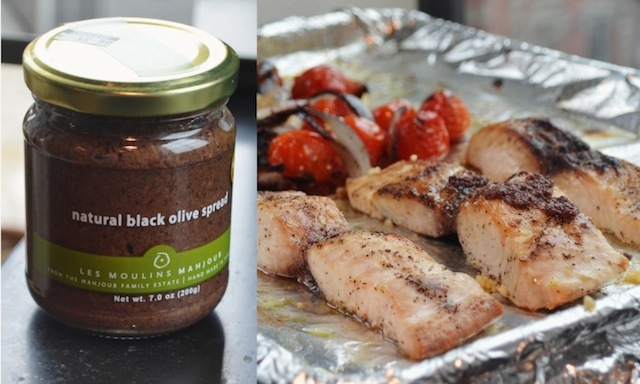 Drizzle fish with 1 tbs oil and broil 4 to 6 inches from heat until vegetables are charred and slightly wilted and fish is just cooked through, 12 to 15 minutes. —Meanwhile, whisk together vinegar, tapenade, ¼ tsp pepper, and remaining 2 tbs oil. 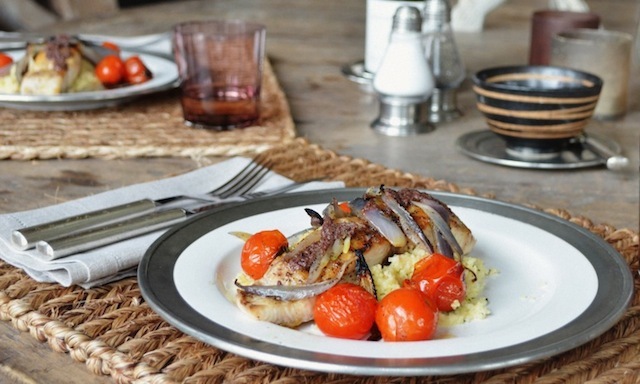 —Serve fish and vegetables over couscous. Stir pan juices into vinaigrette and drizzle on top. My cat loves MahiMahi but I would not share any of this version. Sounds and looks so good. I think striped bass would be really good for this too. I see we share The Selby in our bookmarks. Your site is beautiful. That tapenade vinaigrette: not recommended for kitties!